Emirates NBD, the leading banking group in the region, was formed on 19 June 1963, when H.H. Late Sheikh Rashid bin Saeed Al Maktoum signed the Charter of Incorporation of the National Bank of Dubai (NBD) which became the first National Bank established in Dubai and the United Arab Emirates (UAE). With the blessings of H.H. Sheikh Mohammed bin Rashid Al Maktoum, Vice President and Prime Minister of the UAE and Ruler of Dubai, NBD merged with Emirates Bank International (EBI) on 06 March 2007, to form Emirates NBD, the largest banking group in the region by assets. On 16 October 2007, the shares of Emirates NBD were officially listed on the Dubai Financial Market (DFM). 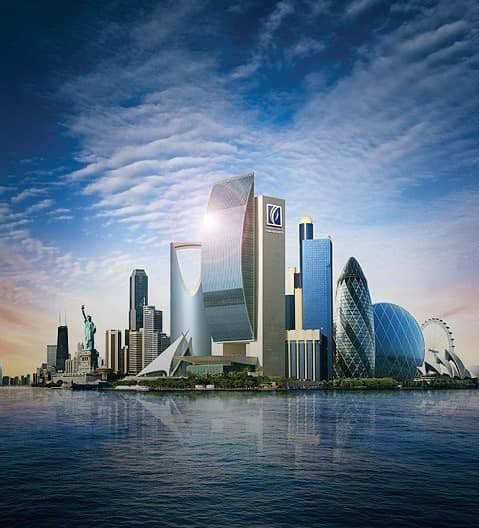 The merger between EBI and NBD to create Emirates NBD, became a regional consolidation blueprint for the banking and finance sector as it combined the second and fourth largest banks in the UAE to form a banking champion capable of delivering enhanced value across corporate, retail, private, Islamic and investment banking throughout the region. In 2013, Emirates NBD celebrated its 50th anniversary, marking the Group's outstanding achievements while highlighting the bank's solid historical and financial foundations as well as its promising future. As at 31st March 2019, total assets were AED 525.8 Billion, (equivalent to approx. USD 143 Billion). The Group has a significant retail banking franchise in the UAE and is a key participant in the global digital banking industry, with over 90 per cent of all financial transactions and requests conducted outside of its branches. The bank was declared the Most Innovative Financial Services Organization of the Year at the 2017 BAI Global Innovation Awards. The bank currently has 234 branches and 1076 ATMs and SDMs in the UAE and overseas and a large social media following, being the only bank in the Middle East ranked among the top 20 in the ‘Power 100 Social Media Rankings’, compiled by The Financial Brand. The Group has operations in the UAE, the Kingdom of Saudi Arabia, Egypt, India, Singapore, the United Kingdom and representative offices in China, Indonesia and Turkey. On 8 November 2017, it opened operations in Mumbai, India. The Mumbai branch marks Emirates NBD's fifth international branch outside of its UAE network. The Group is an active participant and supporter of the UAE’s main development and community initiatives, in close alignment with the UAE government’s strategies, including financial literacy and advocacy for inclusion of People with Disabilities under its #TogetherLimitless platform. Emirates NBD Group is a Premier Partner and the Official Banking Partner for Expo 2020 Dubai. Preservation of the UAE culture and heritage is at the heart of the Group and in addition to supporting various initiatives that aim to preserve the UAE culture, Emirates NBD launched in 2003, the first pearl museum in the region containing the largest collection of natural pearls in the GCC. The Emirates NBD Pearl Museum is a gift from the late Sultan Al Owais, the founder of the National Bank of Dubai to the people of the UAE to remind them of their culture and heritage before the discovery of oil. Currently, more than 9,000 people, representing 70 nationalities, are employed by Emirates NBD, making it one of the largest and most culturally diversified employers in the UAE. As a national banking champion, Emirates NBD is an ambassador of economic and social progress for the entire UAE to the world. Emirates NBD received many prominent awards over the years. Click here to view our awards.